Nowadays, it is not just humans that can interact. Ubiquitous computing and IoT has bridged the physical and digital worlds, allowing machines, vehicles, buildings, and other embedded devices to collect and exchange data over a network without human-to-human or human-to-computer interaction. This 2-minute Kickstarter video communicates the promise of an IoT technology: Micro Location. FollowMeBee uses ultra-wide band technology to lead users to a certain destination or even to a person who has the app. It would be more accurate than GPS and would be able to relieve the stress of confusing map applications as the user can just follow the drone. We thought this was a viable product because many people have issues finding their way around. Although existing mapping technology is decent, it can still be very confusing. Within five minutes of using GoogleMaps, our team was able to find a situation in the guidance system where it was unclear whether the suggested path was through a building, underneath or over the building. We also found that when users start a mapping app on their phone, the GPS is not accurate enough to know which side of the street they are on and it does not know which direction they are facing until they have moved. This frequently causes a person to start walking in the wrong direction. Phoebe is a college student who majors in cello. She loves listening to all kinds of music and believes that music is what feelings sound like. She has a good ear but cannot tell the difference between pink and red. She failed multiple statistics exams because charts and graphs looked too complicated for her. She does not have a sense of direction as well. Every time her quartet people change their practice room, she has to prepare for a long journey. She wishes she had a guide like Tinker Bell, who she can carry around all the time whenever she gets lost. We decided that we would only have the bee (drone) say things when shown from its point of view. We also wanted to limit the amount of words it says because we didn’t want the audience to think the actual drone speaks. We used the drone to explain what our product could do. Keeping with our theme, “show, don’t tell”, we added pop-ups when the drone was interacted with on the phone. The drone responds with things like, “I know where that is!”, in order to convey to the audience that the drone is supposed to find things for them. Scene 1 depicts a situation where Phoebe is lost and tries to find her way to the destination. She pulls her bee out from the pocket and starts following it. While getting to the place, she becomes distracted and the bee stops to look for her. This scene was inserted in order to emphasize that the drone keeps its maximum distance from the user. When she arrives to the destination, she puts her bee back to her pocket, which shows the drone's portability. If Scene 1 was about finding a location, Scene 2 is about finding people. Since the drone has Micro Location Technology, it is able to find people inside the building. Scene 2 illustrates a situation where Phoebe tries to find her friend in the library. 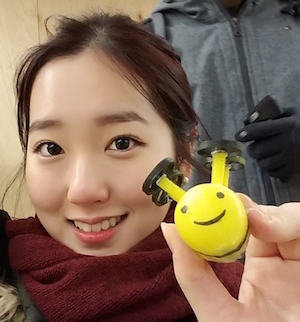 In order to have a nice looking bee drone, we 3D modeled a bee and printed the model using a 3D printer. The propellers were printed separately and glued on. The first propeller (yellow) design didn’t look very good so we made a circular propeller. For the stripes, we painted tape and wrapped it around the body. The same was done for the eyes and mouth. The propellers were spray painted black and glued to the main body. The attached fishing line was used to create the appearance of floating and movement in our video.